US, 1959, 93 minutes, Colour. Shirley Mac Laine, David Niven, Gig Young, Rod Taylor, Jim Bakcus. 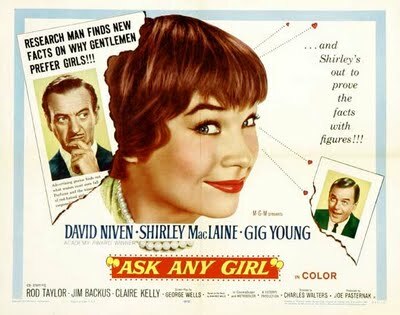 Ask Any Girl was very popular in its time – even getting some awards and nominations. Shirley Mac Laine won a BAFTA award as well as best actress at the Berlin Film Festival for her performance. She was also nominated for the Golden Globe. However, in retrospect, this film seems like any of the romantic comedies of the 1950s. In fact, the plot outline has some resemblance to the Audrey Hepburn- Humphrey Bogart- William Holden vehicle, Sabrina. David Niven and Gig Young play two brothers. Shirley MacLaine? is the innocent young girl who comes to the city, falls in love with the younger brother, does not know that the older brother has fallen in love with her without realising it as he tries to prepare her to be worthy of his younger brother. Gig Young is the younger brother. David Niven, the older. Also in the cast are Rod Taylor at the beginning of his Hollywood career and Jim Backus. The film is a Shirley Mac Laine vehicle – showing how talented an actress and comedienne she was. She had emerged on-stage on Broadway in The Pyjama Game in the mid-50s and shone in her earliest films with Dean Martin and Jerry Lewis in Artists and Models and in Hitchcock’s The Trouble With Harry. This began a career which has spanned at least fifty years – still getting her high billing in her seventies. She won her Oscar in 1984 for Terms of Endearment. The film is directed by Charles Walters, best known for a range of musicals that he directed at MGM during the 1940s and 1950s including Easter Parade. 1. The expectations of the tone of the tale? The impact of the stars? The stylish colour and wide screen comedy? 2. The characteristics of this kind of comedy film: witty lines, humorous situations, farce, satire, mixture of identity, comedy of manners? 'What conventions were used and how well? 3. What insight into characters and situations came via comedy of manners? The presuppositions of those who make such films? The presuppositions in the audience about behaviour? Morals? 4. The title's emphasis on any girl, the focus on women, at the beginning and end? Meg as focus? Her arrival in New York, having her luggage stolen, being hounded? Her aim for career and husband? Her resorting to schemes for a husband? her disappointment in artificiality? The nature of true love? Was Meg meant to be a depth character or was she merely a focus for the comedy themes? 5. The straightforward tone of the story in its presentation of the relationship between men and women, the pursuit of women by men? The irony in this plot? The battles between men and women? Women outwitting men? The satire in this? 6. The film’s presentation of men: cads, charmers, gentleman, bosses? Mr Stafford as a cad? And his charm? Miles as a stuffy gentleman, Mr Maxwell as boss? How were these men types to illustrate the themes of the film? 7. How attractive were the Doughton brothers? Evan and his irresponsible charm? Meg’s attraction towards this? The couple? Her falling in love with him? 8. The irony of the details of Meg’s research? Her various jobs, her capacity for learning, the details of investigating Evans’ style and liking for women. Meg’s discovery of the truth? 9. How was the film presented as a modern fairy tale, Cinderella, of New York in the 1950s? 10. Does this kind of comedy of manners appeal now? Why so popular in its time?